SureCrete Design manufactures over 1,400 decorative concrete products for the concrete industry from our headquarters in central Florida. These cement product lines work together to complete systems for applications on concrete floors, walls, countertops, ceilings, and architectural elements. We take great pride in offering the latest cementitious technology, combined with relentless quality control. When you use SureCrete products, you also receive the industry’s best technical support through our over 100 distribution locations, our videos online, and our national telephone lines. There are 7 departments that hold the 1,400 sku’s. The first, and some might say the most important, is Surface Preparation. You are only as good as what your next product used can bond to. Resurfacing concrete mixes that can increase the wear ability of the original surface while adding texture and design can be found in Overlay Bag Mixes. Creativity is the heart of the Color and Stains section, here you will find everything you need to bring your dream to life. For those who enjoy fabricating our Cement Casting department holds the flagship lines of the Xtreme Series and DFRC Counter Top Mixes. Epoxy systems including broadcast and mica pearl metallic infusion can be looked at in Floor Metallic and Flakes. Protecting your concrete is simplified through the Sealers and Coatings department. In this section you will find the best options for clear and pigmented exterior and interior sealants. Finally, we have tools and accessories for the application of all decorative concrete products, SureCrete systems. NanDro manufactures and installs environmentally-friendly protective shields, sealants and concrete materials. Our coatings, sealers and materials can be used to defend your surface from harmful environmental elements as well as everyday wear and tear! NanDro also is an applicator and can coat your products in house or out in the field. NanDro Concrete Shield protects concrete and masonry surfaces from multiple destructive forces. Unprotected concrete surfaces can be damaged by water, salt spray, acid from food/beverages & waste, gum, graffiti, and chloride ion. When coated, the concrete surface will not only be protected from these damaging elements, but will also be aesthetically enhanced with a peel and flake resistant gloss or satin finish. NanDro Wood Shield is the all in one solution for protecting your everyday wooden surfaces. It protects from UV damage, acid etching, water spots, moisture and other natural decay. These features make it ideal for use not only in the home, but also in industries such as restaurants, marinas, decks, furniture, and the rest of the great outdoors. NanDro Metal Shield is ideal for protecting, and preserving metal surfaces under various conditions. It provides protection against all types of corrosion from water, salt spray, chemical exposure, as well as other damaging environmental elements. Due to its anti-corrosion properties, the Metal Coat also eliminates the need to polish easily tarnished metals, such as aluminum, copper, and brass. It also provides UV protection for the metal surface and reduces ice adhesion. Also available is the NanDro Stainless Steel Coating. Residential and commercial concrete interlocking paver and landscape curbing installer. Local company with the same owner for over 18 years. Call the office for information. Or if you want to see our work in person? Visit any Lennar location in Trinity/Odessa. Now in BEXLEY! We have very competitive pricing. Thank you for choosing Fisher's Landscape. We have over 35 years of experience in Lawn and Landscaping, Top quality at Competitive Prices. " 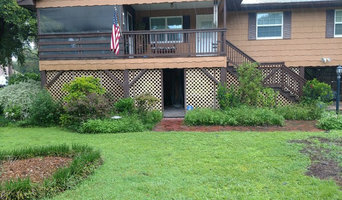 FISHER'S LANDSCAPE WILL MEET OR BEAT any written estimate from any licensed and insured company. "Price and Quality". " NO JOB TOO SMALL"
We are a full service landscape/hardscape design and install firm. We can take your ideas from concept to a finished product. We take great pride in our ability to create beautiful, functional and innovative outdoor living environments. Our state-of-the-art hardscape designs will upgrade the value of your property while enhancing the usability of your outdoor living space. Whether you want to design a new driveway, walkway, entryway, outdoor patio, pool deck, or other hardscape installations, Kingdom Pavers will bring your vision to life. Our primary goal is to deliver exceptional service, ensuring that both commercial and residential customers receive the highest level of quality in all aspects of each job that we take on. No job is too small nor too big for us to give you excellent customer service every time. 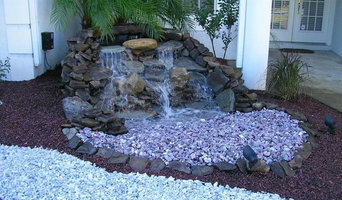 We specialize in complete landscape & hardscape designs, outdoor kitchens, fire features, sod, concrete design and more! Contemporary Stone Work, LLC prides itself on being the go-to choice for clients looking for Concrete Pavers, Stone Veneer and Outdoor Fireplaces services. We very much appreciate your interest in INCREATIONS. Our aim is to allow you to be completely worry free as we transform ordinary concrete into architecturally pleasing and extremely durable maintenance free surfaces. We are aware of the focal points in your choosing a service provider: Expertise Professionalism Integrity Performance INCREATIONS provides a quality staff of concrete professionals with over twenty two years of experience in the decorative concrete industry, but more importantly, personal contact throughout each phase should there be any questions or concerns. Our extensive experience in the decorative surface industry has taught us the importance of time scheduling and phasing, whether it is a commercial or residential project. We know our clients expectations and also areas of concern. We will fulfill your expectations and alleviate needs for concern. Thank you for your interest. We look forward to assisting you on current or planned installations of architectural decorative concrete. I look forward to the opportunity of being of service to you. Tired of your mulch washing out? Or your grass intruding into your gardens? At Cypress Curbs, we have the ultimate solution: concrete landscape edging! We can help end the frustration of lost time, lost money, and the repetitive effort of constantly cleaning up washed out mulch, stone and rocks from your flower bed or garden. Maintaining edging and garden materials will be easier than ever with our high-quality custom and decorative concrete landscape curbing! Surface Creations began in 1999. We are different in the construction industry in that we value quality over quantity. As a smaller company we cannot glaze over our jobs and rely on the next job to erase over time the poor workmanship from the previous. Each job is done so that it advertises to a future customer what we are capable of. We take our time to ensure each job is completed as if it were part of our own home. There are many corners that can be cut in the construction industry with materials and techniques that will lower the quality of the end product. Most of this is not readily visible in the end and some of it although right in plain site is just not seen by the untrained eye. 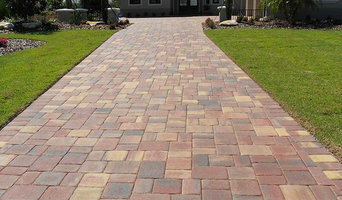 We don’t use inferior materials and only the best quality pavers and acrylic available from companies long histories of making a good product and a reputation for taking care of their customers, both home owners and installers alike. We are constantly updating our application methods to create the best possible end product. We create new and unique designs and techniques to give our customers the newest and best. We have been in business for over 20 years! Starting from a small office in our house we have expanded and grown to be one of the largest concrete painting companies in Lake County, employee 15-20 Lake County residents! Our services are truly One of a Kind, due to our emphasis on the art of concrete decorating, large selection, and Staff Artists. With us, no two projects are alike. All of our clients are very impressed with our large and unique selection of products. Our focus on quality artwork and design all us to offer a wide variety of unique services. Providing all of your concrete needs! 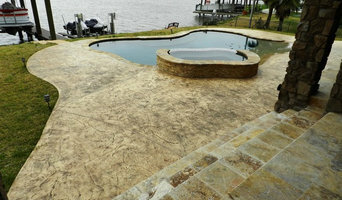 For an affordable yet high-end look in Land O' Lakes, FL, stamped concrete patios are the way to go. A Land O' Lakes concrete stamping professional can replicate the appearance of natural stone or pavers, creating a surface that requires minimal maintenance. With endless decorative concrete design and color combinations, it’s important that any Land O' Lakes, FL stamped concrete contractors you’re interested in show you photos of their work to ensure you’re on the same page.